Proving how versatile SU stamps are. Last post showed how a Christmas stamp set can be used as a birthday stamp. Now I’m going to show you how to make a beautiful Christmas card from the very same stamp set. I can see myself using this stamp for lots of things. It’s just beautiful. I have stamped the pointsettia image onto vellum card stock and heat embossed it with silver embossing powder. 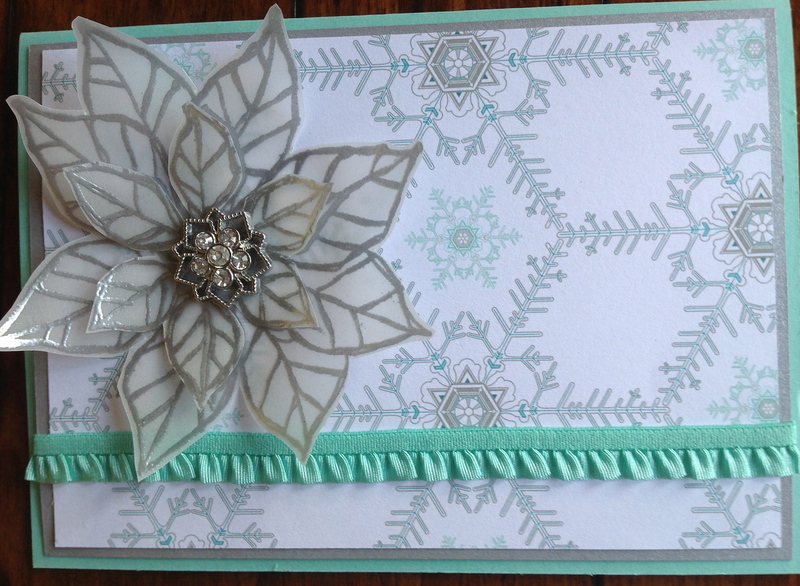 Then layered the centre image and topped it with a beautiful embellishment from the current Holiday mini catalogue. Are they not just adorable? Want to learn more? Want to make delicious Christmas cards for your friends and family this year? Find yourself into one of my classes at Stanthorpe or Tenterfield and I’ll show you how to make some sensational cards. Contact me today to reserve your seat. Don’t live in my area? I’m happy to pre-cut everything for you and do a special price for all the supplies and have them delivered to your door together with full instructions etc. There’s just no excuses not to WOW your friends with beautifully created by you, Christmas cards this year. Until next time, be very kind to each other. DSP – Winter frost DSP stack. (available in card front size of 12 x 12) That’s the versatility of SU!